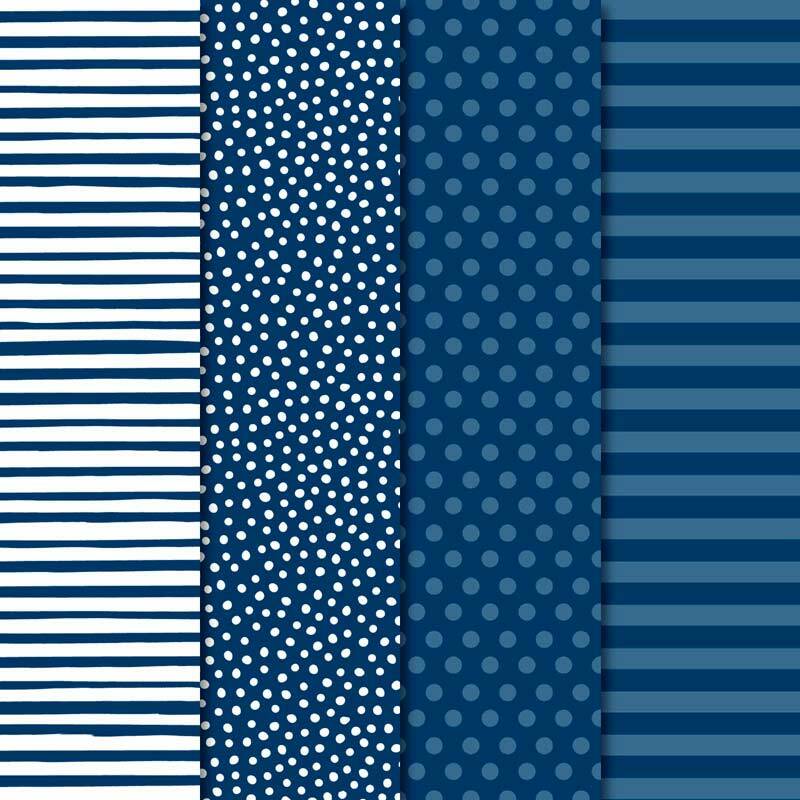 Night of Navy, I LOVE this colour! I love the richness of it, and it just feels luxurious to me. It's a perfect colour for any occasion card. 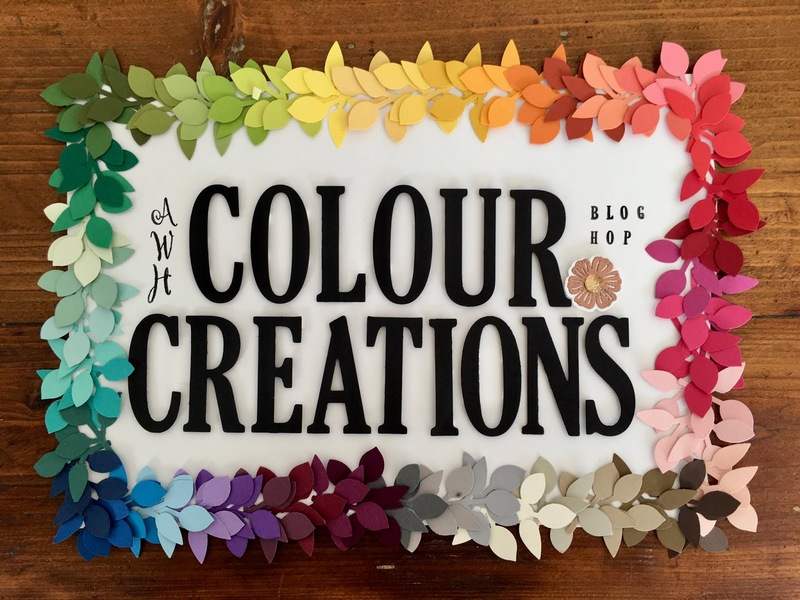 Here is my creation for tonight's colour challenge with the AWH team. 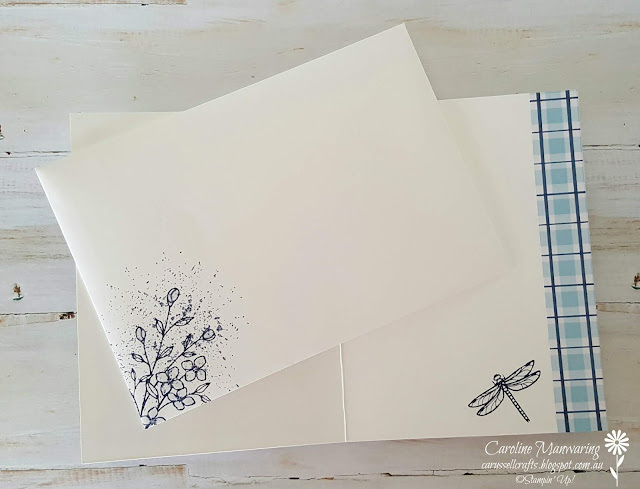 Touches of Texture is a stamp set that I haven't inked up in such a long time, and I'm so glad I got it out for this card, because it has some beautiful images in it. It is an image only stamp set, so for the sentiment, I chose one from Varied Vases. 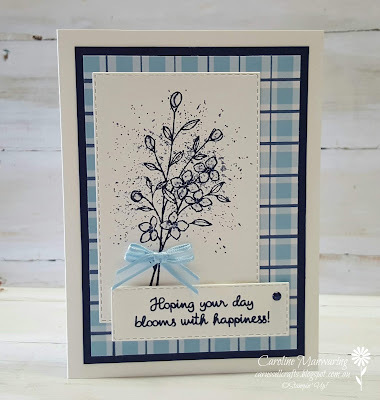 For the DSP, I added thick and thin lines from my night of navy Stampin' Blend marker, to a piece of the balmy blue Gingham Gala Designer Series Paper. I backed this with a piece of Night of Navy cardstock. 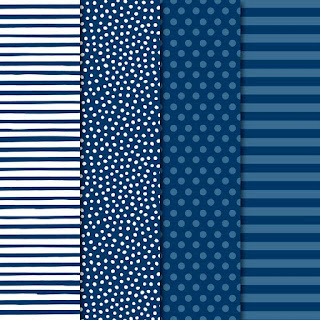 I love any colour in gingham, and the best thing about this paper is that one side has large squares and the other has smaller squares. That's a win, win for me! Other colours in the 6" x 6" pack are - Daffodil Delight, Grapefruit Grove, Highland Heather and Lemon Lime Twist, all with Whisper White. - Gorgeous!!! I'm also having fun using our fantastic new rectangle stitched framelits! I'm sure you'll be seeing lot's of cards and projects showing off these great dies, everywhere. I stamped one of our envelopes, front and back, to match the card too. 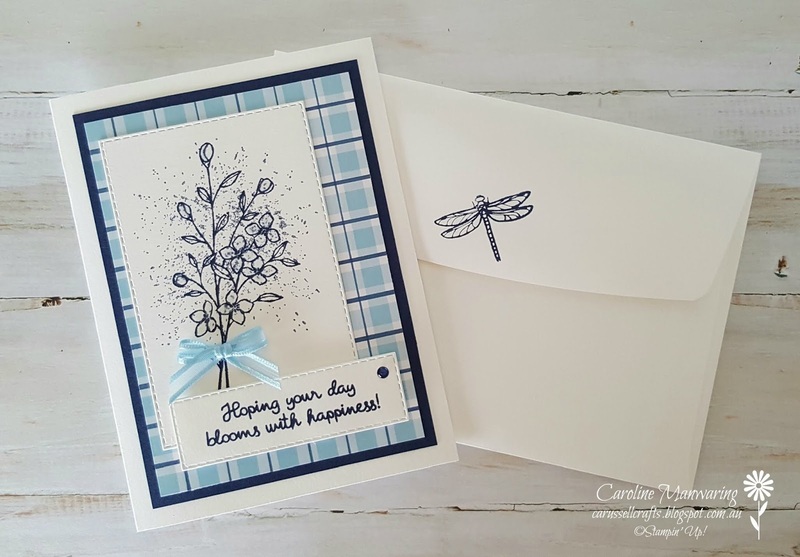 And inside the card, I stamped the dragonfly and added a strip of the leftover DSP. 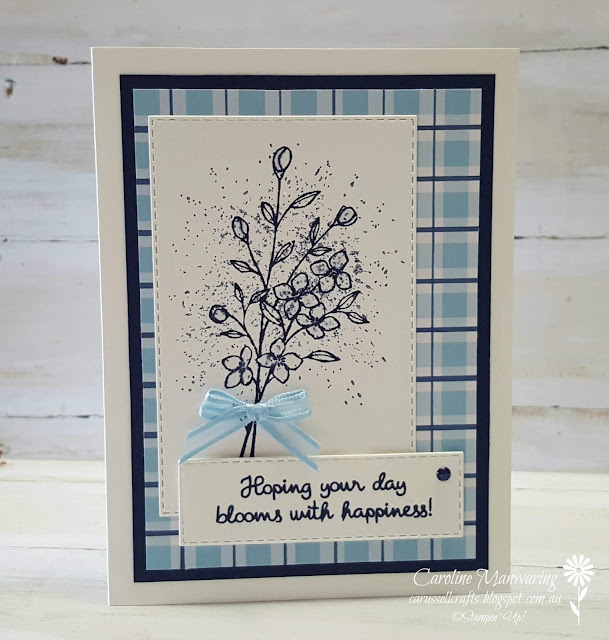 I brushed some sparkle onto the flower petals and buds with the Wink of Stella pen, added a bow of gorgeous, balmy blue organdy ribbon, from the combo pack in the Sale-a-bration brochure, and a night of navy enamel dot from the Happiness Blooms suite. 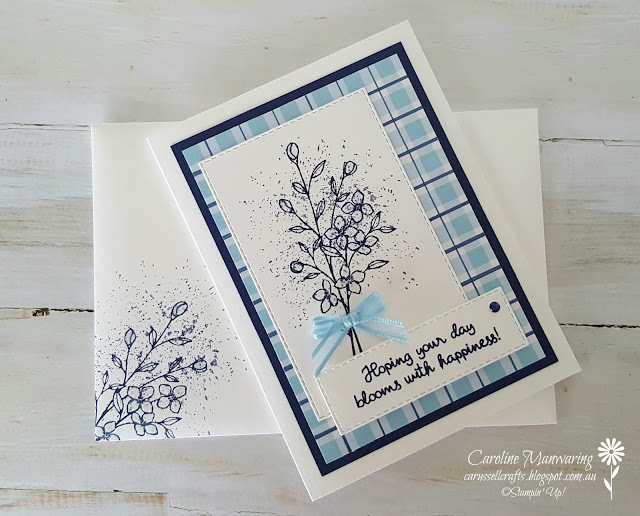 Thanks for stopping by, jump over to Catherine's blog now to see what she has created for tonight's hop and check out the list of participants, for some Night of Navy inspiration from the Art with Heart team.